When it comes to observing the world, one of the most reliable senses is our sight. People literally need to see some things to believe it. That’s why optical illusions are so fascinating, because it shows that we can’t even trust our eyes when we’re staring directly at something. They also show how complex our visual system is and what the little quirks of it are. In the picture above, it looks like the lines are curved, but they are actually straight and parallel. What’s so amazing is that the reason we possibly see it that way is because we’re actually seeing into the future. Really. It all comes down to how the brain perceives sight. When light hits your retina, there is about a one-tenth of a second delay before the brain turns that signal into a visual perception. The thing is, the human brain has evolved so it compensates for the delay, so the visual system creates an image about what will happen one-tenth of a second into the future. This ability is the same one that allows us to maneuver through a crowd or catch a fly ball. How it applies to the Hering Illusion is that the image tricks us into thinking that we are moving forward into a vanishing point in the distance. 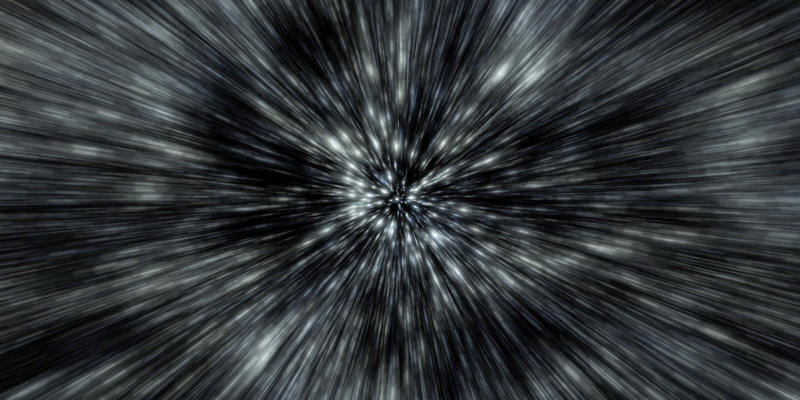 It is similar to a science-fiction movie where a spacecraft is moving at an incredible rate of speed, it looks like they are heading into a tunnel and everything is warping around them. Would you believe us if we told you that the two figures in the image on the left and the two black lines in the picture on the right are the same size? Well, since you’re reading a list about optical illusions, then there is a good chance that you do believe us, but go ahead and measure it any ways. The illusion is caused by something called linear perspective, which happens because we see the world in three dimensions. If two lines are converging, in the case of the picture it would be the walls, our brain interprets the lines as staying parallel and receding into the distance. It is similar to standing on a railroad track and looking at it converge off in the distance, although they are staying parallel. So in pictures like those above, the mind sees the object, which appears in the distance and since it isn’t smaller, as something would be if it’s in the distance, it makes the second object look much larger. Everyone who has been on the internet has probably seen the spinning dancer. Usually there is a disclaimer that says if you see the dancer spinning clockwise, that means you are a right brain person and are creative. If you see it going counter clockwise, then you use the left side of your brain and are more logical. However, that is not true at all and the spinning dancer is in no way a neurological test. Instead, it is simply an illusion called a reversible or ambiguous image. The reason that people can see it spinning in different ways is because there are no depth cues in the picture and our brain interprets it in three dimensions. Then, in our visual system, there is something that is causing the flip, but scientists are unsure what causes it or why certain people see it one way instead of the other. For the picture in this entry, what is the design? It looks like spirals, right? But they are actually perfect concentric circles. If you don’t believe us, trace your fingers over the circles and you’ll see that they are round and never intersect with one another. The illusion shows the difference between what the eyes see and what the brain recognizes. What the visual system is trying to do is figure out what pieces are part of the same object. So people see spirals because of the alternating colors and that makes it look like the objects are color coordinated instead of being in the same shape. If you stare at the black dot in the image above, when the black and white image comes back up, you should be able to see it in color. Pretty trippy, huh? The reason you see the colors is a phenomenon called afterimage. What happens is that there are three types of color receptors in the eye that are most sensitive to color and they take in red, blue and green. So when you stare at these colors for too long, the receptors get tired. Then when you look at a white background, the tired receptors don’t work as well and the color receptors are out of balance. This leaves you with the afterimages and it goes away once your tired receptors adjust. If you watch the flashing images above and just focus on the faces, you’ll notice that it is just pictures of celebrities and there is nothing wrong with them. But if you focus on the cross in the center and look at the pictures in your peripheral, you’ll notice that the pictures look grotesque. The foreheads are bulging, the eyes get much creepier and their noses are huge. The illusion, called Flashed Face Distortion Effect, was discovered by accident. An undergrad first noticed the effect when he was flipping through pictures quickly on the computer. Then the researchers found that if you align the eyes and flash pictures quickly, the difference became more grotesque. A notable change is that it exaggerates features. For example, if one person has a large forehead, then it appears even bigger in the picture. The researchers are currently looking into what would cause this odd phenomenon. In the above picture, nothing is moving. It’s not an animated GIF or a video; it’s just an illusion that induces motion called illusory motion. While it is a common optical illusion, no one is really sure what causes it. One school of thought is that involuntary eye movements make objects near what you’re fixated on look like they are moving. The other possible reason is that it’s caused by motion detectors in your visual cortex. When you look around the picture, the detectors get confused because of the constant changes in the image, so your brain thinks that it’s seeing motion. With this fascinating illusion, look at the cross in the center of the picture. After a few seconds, you’ll start to notice a green dot going around and it appears to eat the purple dots. But if you divert your eyes and look back, you’ll see that the pink dots are still there. Why the blank spot turns green is because the lilac colored dots have oversaturated your retinas. So when the lilac disappears, you see the green because it is a complimentary color; it is a white light without the lilac color. The disappearance of the dots apparently happens because our visual neurons have the ability to turn off their awareness of things that aren’t changing. Instead, we focus on things that do change, so it simply follows the blank spot because that is the only thing that is changing. It’s similar to a bug landing on your arm, if it stands still then you don’t feel anything, but it moves, then you feel it. As depicted above, there are two pictures of the same man. When you look at the pictures upside down, they look perfectly normal. But when they flip so that they are right side up, you’ll notice that the man on the left’s face has all upside down features. This strange quirk in our visual recognition system is called the Thatcher effect because it was first demonstrated on a picture of Margaret Thatcher in 1980. There are a number of ideas as to why this happens. The first is that people possibly have a problem recognizing upside down expressions and the brain tries to fix that. The second possible explanation is that when people look at something, they have to orientate themselves as to what way is up. Another possibility is that we see a face as a whole, so when the whole face is flipped, we still recognize it as a face. Finally, it may have nothing to do with the faces, but it could just be that we’re used to seeing things one way up. Looking at the picture above, what colors are squares A and B? They should be gray and white. Now, place your finger along the fold and look at the bottom square. They are both gray, right? The reason your eyes see the color(s) that way is similar to the internet phenomenon “The Dress” where some people saw a black and blue dress, while other people saw a white and gold one (in reality, it was black and blue). The leading theory on why people see colors this way comes down to the way that humans evolved. Our eyes are meant to see color in the daylight, so they see objects in context. When you’re looking at something, light goes into your eye and different wavelengths correspond to different colors in your eye. But the very first light that gets to your eye is illuminating the environment, so the brain removes that color from the object, which makes people see different colors. As for why people see the dress as blue and black, for example, is because their mind isn’t as easily manipulated and they can better decipher white balance. Another famous example of the illusion is the checker shadow illusion that was created by a Professor of Vision Science at MIT, Edward H. Adelson, in 1995. Robert Grimminck is a Canadian freelance writer. You can friend him on Facebook, follow him on Twitter, follow him on Pinterest and visit his website. in the ponzo. the two balls arent the same size. i checked it in photoshop. You were right, we checked it too. So we replaced that image with two others that are accurate. Thanks for the catch. I found that when I look at the spinning dancer, she spins clockwise. However, I noticed when reading the paragraph below, she would change to counter-clockwise! Once she did that, then I could see her that way for a while, but eventually she’d return to clockwise.